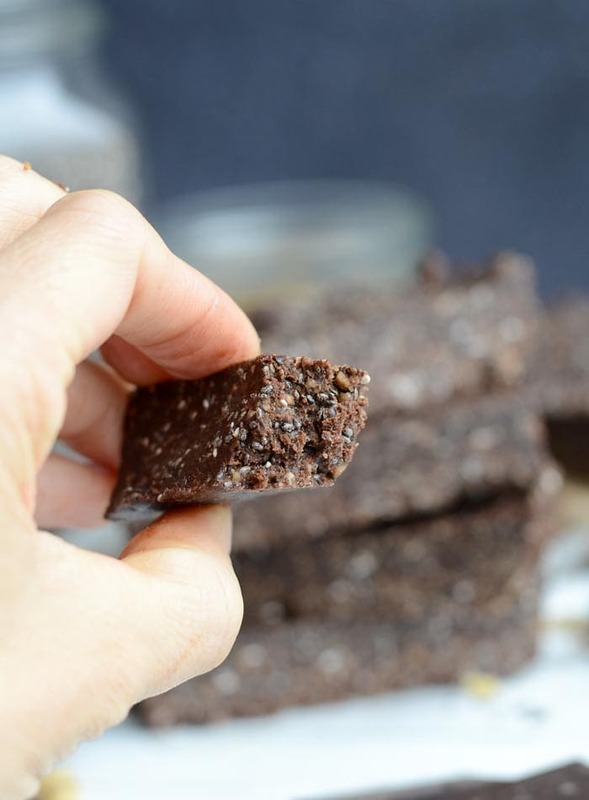 Chocolate Chia Energy Bars: No-Bake, Vegan + Delicious! 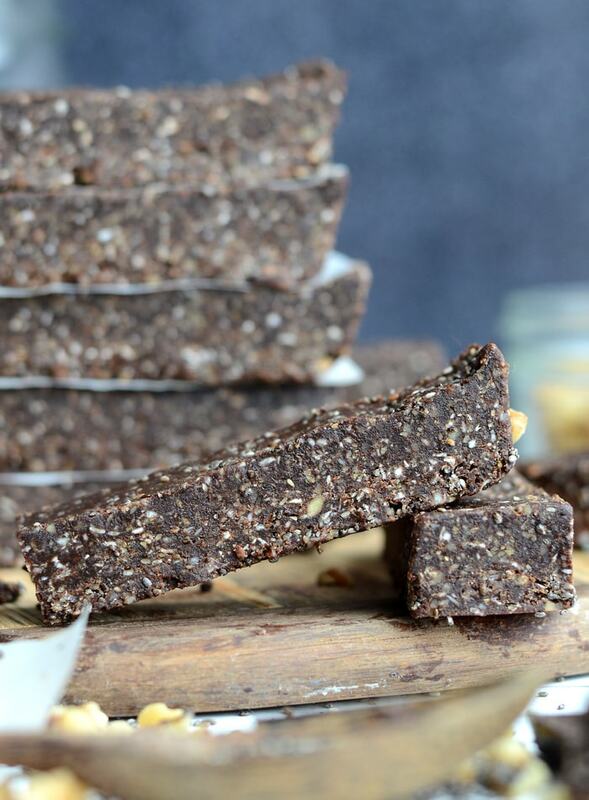 These healthy yet decadent, no-bake chocolate chia energy bars are one of my favourite quick snacks for busy days, weekend adventures and pre-workout snacks. They’re easy to make in a blender or food processor, high in antioxidants, have no added sugar and taste incredible! Meet your new favourite snack: rich, decadent chocolate flavour, perfect soft but firm texture and wholesome, real food ingredients like walnuts, coconut, dark chocolate and chia seeds. Would you rather homemade, vegan, all-natural energy bars or store-bought “energy” bars with a long list of hard-to-pronounce ingredients? It’s homemade all the way for me! These are absolutely one of my favourite all-time snacks. They’re soft and chewy with a little crunch from the chia seeds. The flavour is rich and decadent with hints of coconut, dark chocolate, walnut and sea salt. They are so good! I like to keep a stash in the freezer at all times for sweet but heathy pick-me-ups, and as a nourishing option to take care of any chocolate cravings. 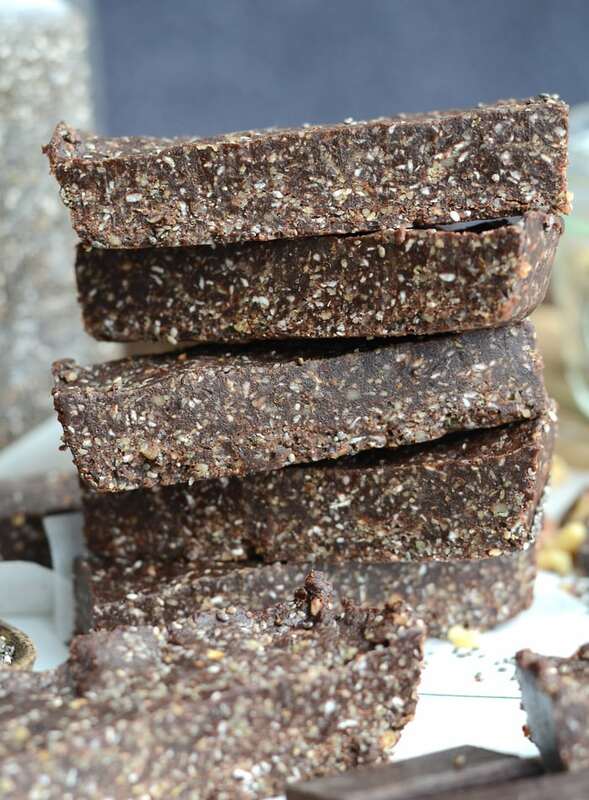 These bars are very energizing and satisfying too. The healthy fats in the chia seeds, walnuts and coconut really help to keep you full and provide long-lasting energy. I love them for a pre-workout snack, post-workout recovery snack and to take on hikes and adventures. They travel well so they’re perfect for taking on the road. 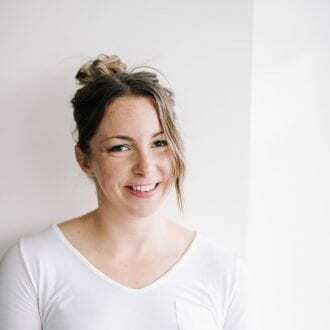 The only downside is you might get a few chia seeds stuck in your teeth, but that’s not so bad is it? Medjool dates – Nature’s candy, plenty of health benefits and one of my favourite foods. Chia seeds – One of my favourite superfood ingredients and a must-have for any healthy kitchen! 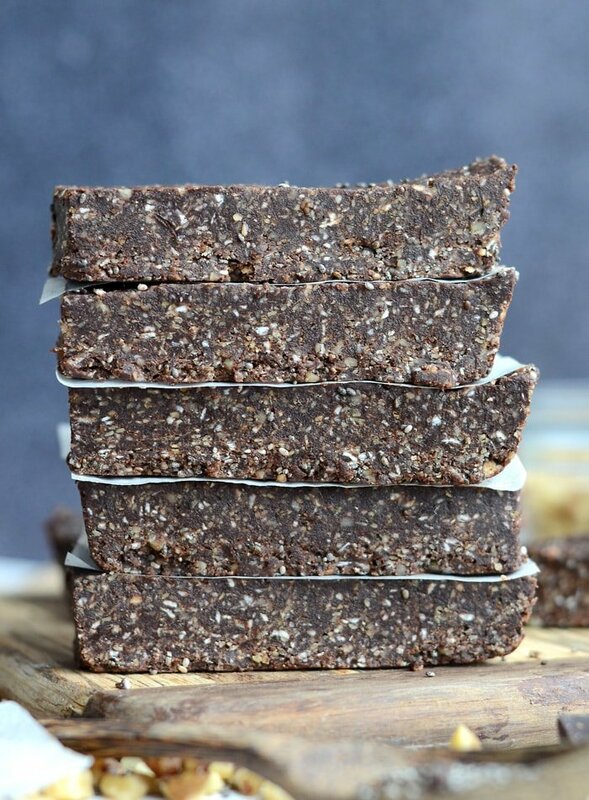 Unsweetened shredded coconut – A must for no-bake vegan energy bars! Energy for days. Walnuts – A super-powered superfood packed with antioxidants, vitamins and minerals and perfect for no-bake bars. Dark Chocolate – High in antioxidants and phytonutrients. I like Green & Black’s Organic Dark Chocolate. Once you have everything you need, it’s simply a matter of creating the “dough” in a food processor or high-powered blender. I use the Ninja Mega Kitchen System for all my no-bake bar recipes and I’ve been very happy with it. Then pressing into a baking pan, setting in the fridge then cutting into bars! Enjoy! Place dates in blender or food processor and purée until they form a thick paste forms. Line a square baking pan with parchment paper. Firmly press the mixture into the pan, pressing tightly into all corners. Place in the freezer for at least a few hours up to overnight. Lift out of the pan and cut into 14 bars. I made these just now, and they are turning out perfect! I substituted a mixture of peanuts, almonds, and cashews instead of the walnuts, and I used almond extract in place of the vanilla. I also added 2 tablespoons or so of coconut oil and they taste delicious! Definitely a healthy on the go snack that I will use again, thanks! Awesome! So glad to hear that 🙂 Great idea on the substitutions! Thanks for the comment! Enjoy! almond extract is such a good shout! Yay! So glad you enjoyed them!! I needed a recipe to use up chia seeds that I bought and don’t know what to do with. These were great. I plan on making them again today for a gathering tonight. Thanks for the wonderful recipe! These look delicious n so easy to make. I wanna give it try so wondering did you use quick oats since there’s no cooking involved? Hi. Did you ever make these with steel-cut oats? Would that make them too gritty? I haven’t tried these with steel cut oats. They would definitely be a lot grittier. You could try blending the oats first so they break down more though. Haven’t tried…but let know if you do! I only have a nutri bullet … Last time I blended dates it started smoking and broke. Should I add water? You could try soaking them in hot water for about 20-30 minutes first, then drain and blend. If that doesn’t work, you’d have to try a food processor or higher powered blender. Yep, that should be no problem! would steel cut oats or old fashioned oats from quaker oats work (not instant) ??? or would they have to be cooked first? Old fashioned oats should be okay, you definitely don’t want to cook them first! Thanks. what about oat groats? Would those work? I just finished making these and they seem a bit crumbly at the edges. I pressed really hard but wonder if that’s how they are until chilled? I pressed really hard and didn’t substitute. My dates formed a big clump of paste in the processor and the mixture was very crumbly until I squeezed a test clump into a ball. Just want to know if this sounds right or it needs some adjustment. Don’t want to waste such precious ingredients! Hi Andrea, mine actually weren’t crumbly at all and held together very well. It could be that your dates were too dry? You could try soaking your dates in hot water for 10 minutes before using. Let me know. They were actually very moist….can you suggest how to rescue the batch? They’ve only been in the fridge about 30 minutes…. I can’t guarantee it will work but you could try adding either a little water, maple syrup, almond milk or coconut oil, probably just 1-2 tsp at a time until everything holds together better. I hope it works for you. I’ve made this recipe numerous times with success and no crumbling, so I’m not sure what happened with yours unfortunately! I was thinking of trying coconut oil. Will do and let you know! Thanks! Sounds good! I hope it works!! I just made these and they are phenomenal. You can’t even taste the dates. The just taste like chocolatey goodness. I added cocoa nibs instead of dark chocolate. Mine were a little crumbly too, but still come out in bar form. Thanks for the recipe! how many bars does this usually make for you? Either 8 larger bars or 16 squares. Can I replace the dates to raisin? Sure, you just made need to soak them in hot water first. These sound super delicious and a great healthy snack but I’m not the biggest coconut fan, is there anything else you can substitute it with? What you would suggest? when u click to print this recipe the amounts for the box symbol is 1/3rd of a cup…very strange. I assumed it was a cup as well. 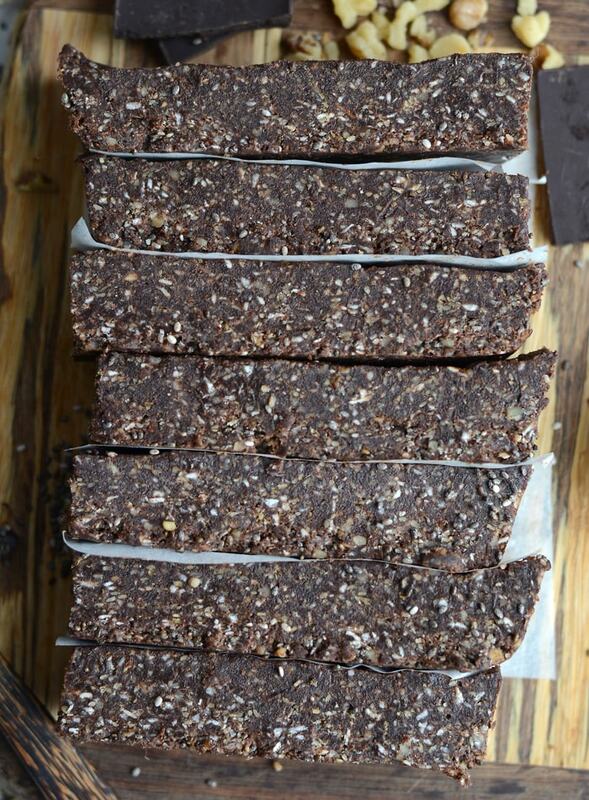 These chocolate chia energy bars look delicious. 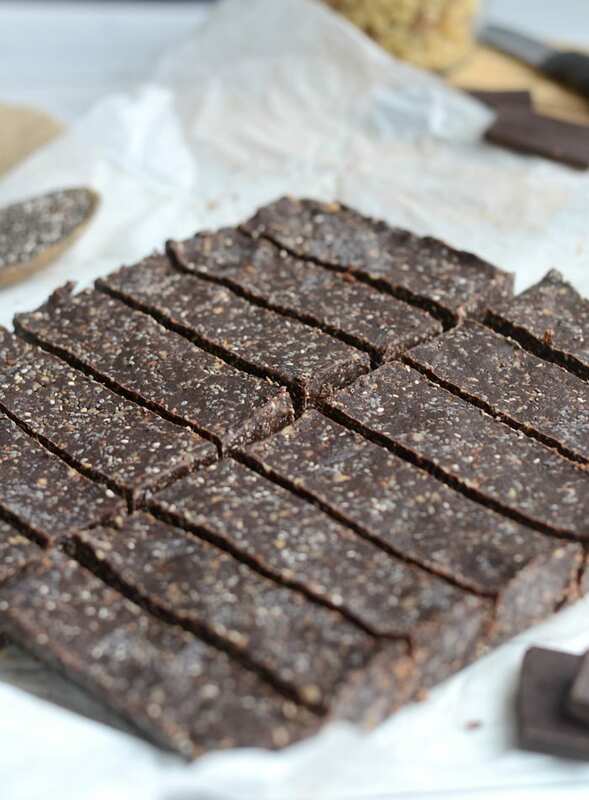 Your kids and even adults will like this simple recipe of chocolate energy bars. 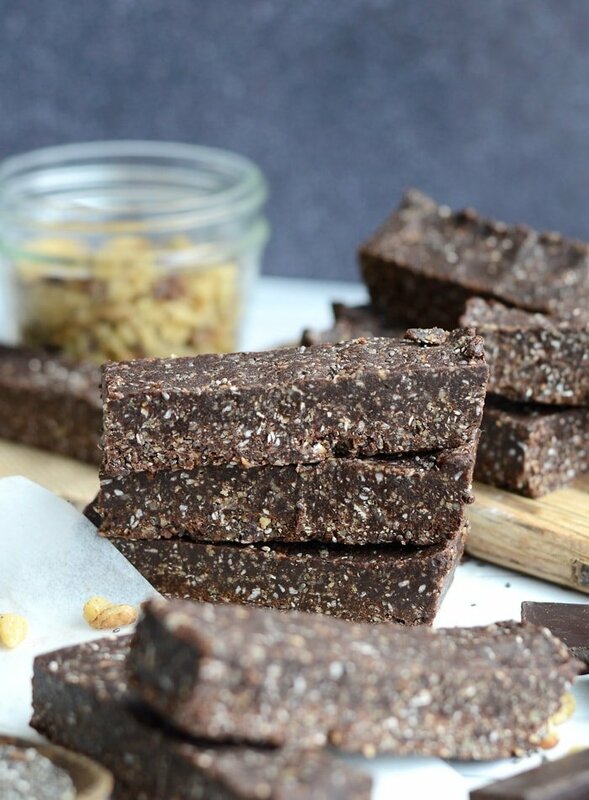 Without baking, you can make these delicious energy bars. How long do you think they last in an air tight container in the fridge for? Hi Eric, they should last up to 5 days no problem, I can’t way any longer because they’ve never lasted that long for me! All I can say OMG delishhhhhhhh. They turned out perfect. Making batch number 3. Very tasty treat. Thank you so much for this. Do you have any suggestions instead of oats? (Grain free) or do you think The recipe would work if I just leave them out?? Just commenting to let you know this is a great recipe. My nephew is such a fussy little eater and it is hard to find things to feed him to boost his nutrition. He absolutely loves these! Thank you for sharing! Blender will work fine, I sometimes use my blender sometimes my food processor. Enjoy! These taste like brownie batter, IM DEAD! I think the dates I used were not moist enough as the mixture seems very dry. Any suggestions to help save them so I don’t need to throw out the mixture? This seems to always happen with any similar recipes I’ve used and I’m thinking the dates might be the issue. I’ll need to find a more moist brand but for the time being I would appreciate a recommendation on how to salvage this batch! I usually use Natural Delights Medjool Dates, if I don’t have those I use bulk, fresh medjool dates I buy from my local natural food store. It’s definetely important that you use fresh and moist dates to help hold the mixture together. If you’ve already mixed it up but it’s dry, you could try adding some almond or other nut butter, or maybe a bit of coconut oil. Some applesauce or mashed banana might also work. If you haven’t find fresh dates, in the future you can soak dates in hot water for 20 minutes and drain before using. I made these this afternoon and I could only wait a few hours to try a bar! Wow, they are delicious! I will definitely be making these again. In fact, I plan on making these instead of buying bars every week from the grocery store! Thank you so much for this recipe. It’s the first one of yours that I have tried, but I will certainly be checking out your other recipes after this! These look great. I saw a comment but not a reply for a substitute for coconut flakes. If there is no suggested sub can it just be omiyted? Mine turn out crumbly too but I like them like that as have been using them to crumble into soya yoghurt for a pudding! Delicious, thank you! Sorry they were too crumbly but they do sound delicious crumbled in yogurt!! 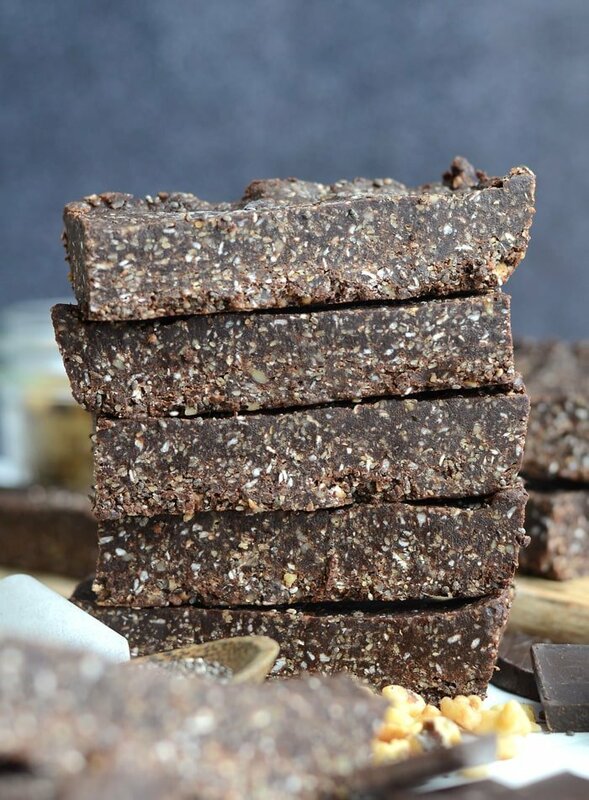 I’m a sucker for chia seeds and chocolate, so this is definitely my kind of energy bar! Me too! These bars are my favourite, they’re so yummy! And I love how easy they are. Let me know if you try them! Definitely real food there folks. Chia seeds are one of those much touted “super” foods that actually delivers and sign me up for anything with chocolate or cocoa. I’m particularly lazy so not having to cook this is just brownie points all day long (pun most definitely intended). You’re so welcome! I hope you enjoy them. Thanks for your comment. Yay! So happy that you enjoyed them. Yes, yes, and yes to the dark chocolate and the no-bake and the healthy and all the things. Oh yum!!! These sound absolutely fantastic!!! Oh this sounds amazing! I love that these are no bake… win-win!! I make these all the time!!! Love them!!! I do add about 1 TBSP coconut oil to recipe and they are not as dry!! Good to know! Happy to hear you’ve been making them! Excellent! Would definitely make these again. I did add a bit of melted coconut oil as they seemed a bit on the dry side when I mixed them up. i was just wondering if a freezer was necessary or if i could just put them in the fridge overnight? i would love to make these but i don’t actually own a freezer! Ya, I think the fridge overnight should do it! They might not be quite as firm but should be no problem. Hi, I really like this recipe. Only question that I have is how it is gluten-free if it has oats? Or you use gluten free oats? Oats are naturally gluten-free but you can use gluten-free certified oats if needed for celiac or gluten intolerance. ???? I’m assuming you use an 8’8 square pan but could you confirm. I don’t want to use the wrong size and mess with the nutrition info. As long as you make 14 bars out of it, the nutritional info should be the same. 🙂 I used an approx. 8×8 pan, it might be a little smaller. Hope you enjoy them! These turned out well, although perhaps because I store my dates in an airtight container in the fridge, it was a little tough going at first in the food processor. I decided to add a few spoonfuls of coconut butter and that helped. ( Besides, it tastes good)! I eliminated the coconut. Mine too was a bit crumbly so I added about a teaspoon of coconut oil. It was still crumbly, but with all the oils in the nuts and seeds, I decided to go ahead and press it into my pan. No more crumbling! These are not very sweet, which is a selling point for me. Nice texture and flavor. Yes, it’s important that the dates are nice and soft so they can hold the recipe together. Next time, try soaking them in hot water and draining before using if your dates are dry. That should do the trick! I like how they’re not to sweet too, they’re just right! Thanks for the feedback! This looks fabulous, thanks so much! These bars are amazing! i just made them for the second time. I added some tahini so they stick together better. last time i added some almond milk. This recipe is a keeper. thank you Deryn!! Awesome, so happy you liked them! Good call on tahini, sounds delicious! Perfect loved by everyone. Thanks. Made them and loved them!! I added 1 scoop of protein powder & a little honey. Amazing! !